Pangolin species vary in size from about 1.6kg (~3.5 lbs) to a maximum of about 33kg (~73 lbs). They vary in color from light to yellowish brown through olive to dark brown. Protective, overlapping scales cover most of their bodies. These scales are made from keratin — the same protein that forms human hair and finger nails. 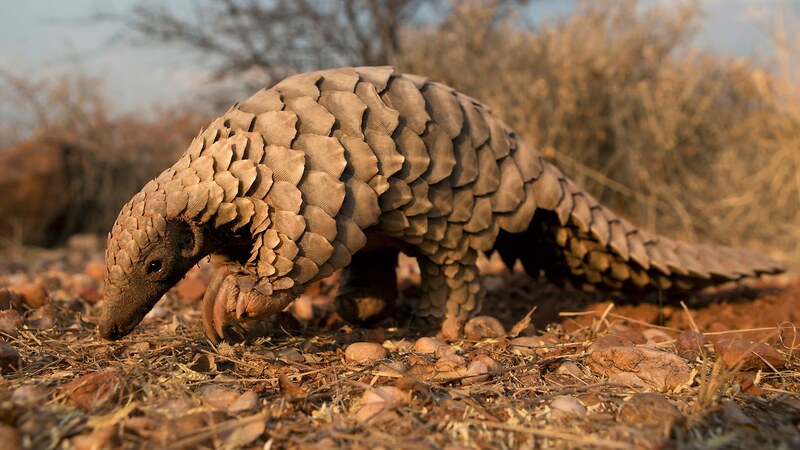 Overlapping like artichoke leaves, the scales grow throughout the life of a pangolin just like hair; scale edges are constantly filed down as pangolins dig burrows and tunnel through the soil in search of termites and ants. Pangolin undersides do not have scales, and are covered with sparse fur. Unlike African pangolins, Asian pangolins also have thick bristles that emerge from between their scales. With small conical heads and jaws lacking teeth, pangolins have amazingly long, muscular, and sticky tongues that are perfect for reaching and lapping up ants and termites in deep cavities. 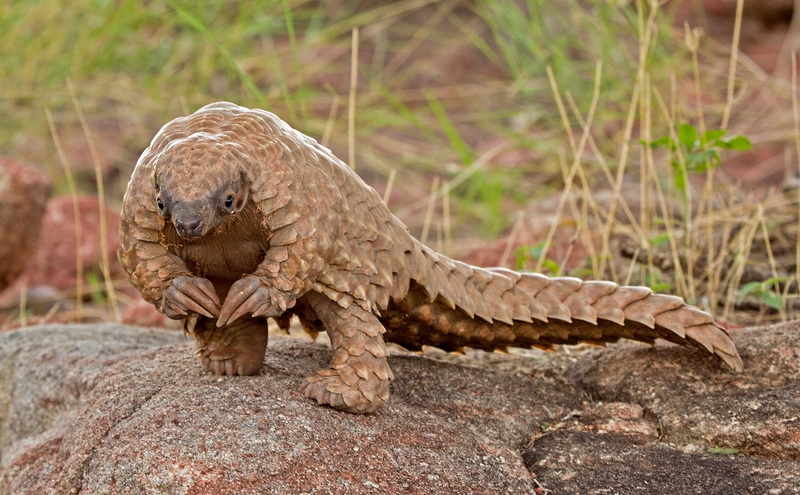 Pangolins have poor vision, so they locate termite and ant nests with their strong sense of smell. A pangolin’s tongue is attached near its pelvis and last pair of ribs, and when fully extended is longer than the animal’s head and body. At rest a pangolin’s tongue retracts into a sheath in its chest cavity. A pangolin’s stomach is muscular and has keratinous spines projecting into its interior. Usually containing small stones, the stomach mashes and grinds prey in much the same manner as a bird’s gizzard. Pangolin limbs are stout and well adapted for digging. Each paw has five toes, and their forefeet have three long, curved, claws used to demolish the nests of termites and ants and to dig nesting and sleeping burrows. Pangolins shuffle on all four limbs, balancing on the outer edges of their forefeet and tucking their foreclaws underneath as they walk. They can run surprisingly fast, and will often rise on their hind limbs to sniff the air. Pangolins are also capable swimmers, and while some pangolin species such as the African ground pangolin (Manis temmincki) are completely terrestrial, others, such as the African tree pangolin (Manis tricuspis), are adept climbers, using their claws and semi-prehensile tails to grip bark and scale trees. Pangolins are solitary and meet only to mate. Males are larger than females, weighing up to 40% more. While mating season is defined, they typically mate once each year, usually during the summer or autumn. Rather than the males seeking out the females, males mark their location with urine or feces and the females will find them. If there is competition over a female, the males will use their tails as clubs to fight for the opportunity to mate with her. Gestation periods differ by species, ranging from roughly 70 to 140 days. African pangolin females usually give birth to a single offspring at a time, but the Asiatic species may give birth from one to three. Weight at birth is 80 to 450 g (2.8 to 15.9 oz) and the average length is 150 mm (5.9 in). At the time of birth, the scales are soft and white. After several days, they harden and darken to resemble those of an adult pangolin. During the vulnerable stage, the mother stays with her offspring in the burrow, nursing it, and wraps her body around it if she senses danger. The young cling to the mother's tail as she moves about, although in burrowing species, they remain in the burrow for the first two to four weeks of life. At one month, they first leave the burrow riding on the mother's back. Weaning takes place around three months of age, at which stage the young begin to eat insects in addition to nursing. At two years of age, the offspring are sexually mature and are abandoned by the mother.